Not normally a skill set the denizens of Test Pit Towers would claim to possess, home baking tends to conjure images of frilly aprons, older ladies, and thick and creamy icing. But before we turn ourselves on even more, we take a look at Aldi's latest Specialbuy Range, one chock-a-block with baking goods and accessories. Seriously? Baking stuff on The Test Pit? Yes. Well, one item on the range's list in particular, the Waffle Maker. A Retro Hand Mixer (£14.99), a Bread Maker (£29.99), Silicone Cake Moulds (£3.49), a Cake Box with Lifter (£6.99) and a selection of Embroidered Tea Towels (£2.99). There are also Preserving Jars (one set for £3.99), a Maslin Pan (£19.99), and a few different Baking Books (£2.49 each). What really excited our sweet teeth however, was the Waffle Maker which weighs in at just £9.99 (and is here pictured with the similarly priced Brownie Maker). Quite frankly we love any kind of technology that makes life easier, so give us a small, light, good looking gadget that periodically churns out sweet goods, and we're sold. 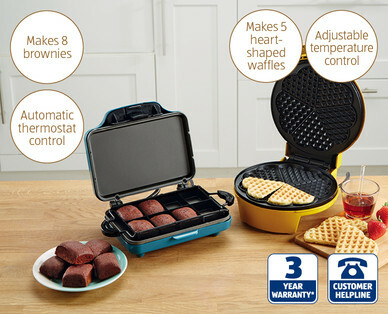 The Waffle Maker seems to be a highlight of the range, because although it seems like it should belong in the Bread Maker price range, actually costing less than a tenner makes this extremely attractive. The maker itself can make, in one go, five heart-shaped thin waffles in just a few minutes when you pour in normal waffle mix (the recipe for which we'll either leave to the internet or your gran to give you). You can then adjust the temperature and time to produce the kind of waffles you like, and then - thanks in no small part to the non-stick heating plate - flick them out and serve with whatever toppings you prefer (caramel sauce all the way here). The unit stores upright easily so as not to take up tonnes of room in your cupboards, and unlike some waffle makers we've tested in the past, was actually easy to clean. We know, right?